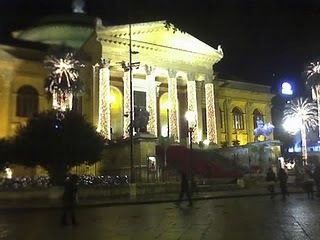 Yesterday the managers of Palermo's Teatro Massimo opera house (shown here at Christmas time) announced that a severe lack of funds threatens the current concert & opera season. They've asked the central government in Rome to fill the huge financial gap. The situation is a reminder of the fragility of an economy where few apparently "private" businesses are really private. The Teatro Massimo Foundation, though "private" on paper, is actually underwritten almost entirely with taxpayers' money. Ticket receipts could never cover even a fraction of the operating expenses of such an organization. (That's also true of Milan's La Scala and other opera houses in Italy.) Apart from the usual problem of gross mismanagement and inflated salaries, the Massimo has suffered from reduced sales of tickets generally during a recession that has made its effects visible in many areas. The Hotel Sole near Palermo's Quattro Canti has closed, while the Palms over on Via Roma is in receivership. Recently a hotel owner near Catania complained publicly that the government should "assist" his failing private business. Admittedly, this trend is becoming apparent in less "socialist" economies in recent times - with the US government bailing out investment banks and car companies. "Too big to fail," and all that. But in Sicily it's normal, and with financial federalism (each region of Italy on its own economically beginning in a few years) the future may see a completely different environment. For now, let's just hope that the Massimo completes its season.